Being new to anything is always a scary prospect from going to your first school, learning to drive, getting a new job. Everything unknown always has a level of apprehension about it. Using a VPN need not be a scary affair though because over the past few years they’ve been made so incredibly easy to use that even if you have no idea about technology you can still get protected within seconds. VPNs are now essential to protect your online privacy much like running a virus-checker. As much of our technology use relies on the internet, a VPN should be considered the first line of defence. If you’ve been put off from getting a VPN because you fear they’ll be too complicated, then don’t. In this guide we’re rounding up the five least-scary VPN services for people like yourself, beginners. They’re all quick to set-up and most importantly, easy to use. How does a VPN benefit me? Is a VPN needed for home use? Are all VPN services the same? Knowing how to select a VPN can save you a lot of hassle and headache in the long run. There are more than 500 VPN services available now, so it’s a confusing landscape. Unfortunately, they’re not all as good as each other which makes things even more complicated. Strangely they all cost roughly the same price. There are a few essential features you should be looking for both as a beginner but also as a regular shopper for a VPN service. Below we’ve listed them. Taking these into account when searching will ensure you end up with a reliable VPN service. Apps for your device – You can set VPN services up manually, but it’s more common to see apps these days that do all the work for you. As a beginner you should ensure the service has apps for the types of devices you want to use it on. Most leading VPN services now offer apps for Android and iOS, Windows and Mac and some TV devices like the Amazon Fire TV Stick. Make sure the service you’re considering provides these. Money back guarantees or trial – It’s more common to see VPN services offering a money back guarantee although one or two do offer trials. These give you peace of mind that you can test the service without risk. If you find they don’t work well or you struggle to use them, then you can get your money back. Suitable for your needs – Consider why you need a VPN. We should all be using VPN services to protect our privacy, but you may have other requirements. Do you want to unblock American Netflix for example? If so, make sure the service can offer this. Not all do so it pays to research or ask before signing up. Fast speeds – If you’re browsing the web, reading emails and chatting to friends then speeds won’t be much of a concern. However, if you like to stream videos on YouTube, Netflix, BBC iPlayer or other similar services then speed is critical. Check out our VPN reviews section where we speed test each service we review. After some extensive testing of features and ease of use, the following five VPN services are our recommended best choices for beginners. Check out the individual services sections below to find out how each performs. You can also click on the names above to go straight to details on that service. Without question, if you’re searching for a VPN as a beginner then check out NordVPN. In our tests we found them to be one of the easiest to use VPN services. They provide apps for Android, Apple iOS, Windows, Mac and Amazon Fire TV devices and because of the simplicity of their layout, it makes them one of the most accessible services to use. From the main screen of all of their apps, you can press ‘Quick Connect’. The quick connect option will connect you to the nearest server. You can, if you wish then minimise the app and continue using the internet like normal. You wouldn’t need to have any further interaction with it – it can’t get much more straightforward. If you want more customisation then you can use either their world map view or country listing to select a specific country. Again, with just one or two clicks or taps, you can be connected to that country. As NordVPN claims to be a no-log VPN service, this means it will protect you with minimal ease. It’s the same situation if you want to watch services like American Netflix. You can connect to any country and still be able to access American Netflix making it easier than most other services. There’s also a lengthy 30-day money back guarantee so if you get stuck or the service isn’t for you then you can get a refund. CyberGhost VPN has been created with users like yourself in mind. Their range of apps are some of the easiest to use that we’ve seen. They’re available for all devices including Windows, Mac, Android, Apple iOS and Amazon Fire TV devices. One of the standout features is their server selection section. It’s split into categories such as ‘For torrenting’ and ‘For streaming’. The streaming section is split further into individual options for specific streaming websites like Netflix, iPlayer, Hulu, Sky Go, Crunchyroll and more. If you’re an avid TV fan, then you’ll love this option. Just like NordVPN, you can connect with the click of one button only which will connect you to the ‘Best server location’. This takes away any of the guesswork and allows you to get protected quickly with no effort on your part – just let the app do the hard work for you. The service also offers a 45-day money back guarantee which is one of the longest available. So you’ve got an extended period to test the service risk-free. VyprVPN’s apps are some of the best designed that we’ve seen. Nothing is intimidating or complicated looking here. As with the other providers you can press the ‘Connect’ button and let the app do the work for you. If you need more choice then there’s an extensive list of countries available to connect to. We liked the ‘Fastest Server’ option which will speed test their entire network and find the one that’s fastest from your location. It ensures you’ll get the best possible connection speed without you needing to think about it. In our recent review of their service, we found their speeds to be some of the best in the industry so you’ll have little interference from the VPN while you’re going about your daily internet use. We liked the free 3-day trial that VyprVPN offer. It’s not common to see a trial like this so you can test the service first before paying. You do need to enter your payment details so remember to cancel if you do not intend to keep it otherwise they will charge you for your first billing period. ExpressVPN have got an enormous range of apps so if you’ve got many devices, then they’ll be the VPN service you’ll want to consider. While their apps are not visually as appealing as the other services, they’re no less stressful to use in functional terms. A large connect button adorns all their apps from their Android and Apple iOS apps all the way through to their Windows, Mac OS and Amazon Fire TV apps. One of the nice new features on some of their apps is the ability to launch other apps once connected. For example, on their Amazon Fire TV app once you’ve connected, you can then open apps like Netflix from within the ExpressVPN app itself. It’s small features like this that will save you time and make their service easy to use if you’re a beginner. There’s a 30-day money back guarantee so you’ve got plenty of time to get to grips with the service. StrongVPN is excellent when it comes to simplicity because their range of apps has the fewest options of all the services listed in this guide. They’ve got apps for Android, iOS, Windows, Mac and the Amazon Fire TV devices. The best feature about this is they all look uniform. So you won’t need to learn many different layouts – once you know how to use one of their apps you’ll be able to use them all. Like the other services, you can one-click connect to their ‘Best Available’ server. If you want then that’s all you need to do and you can continue using the internet like normal. You’re also able to select individual countries and cities if you need. StrongVPN doesn’t have quite so many countries available as the other services. However, you can use one service on up to twelve devices at the same time which is more than most providers. There’s also a 30-day money back guarantee. Even though there are some 500 or more VPN services out there and we’ve broken it down into the Top 5, it can still be challenging to make a choice. Depending on your type of use it may also make one service better for your needs than another. With all these considerations it can seem very confusing. So we’ve broken it down even further to help you make a decision. Just pick the one that most matches your usage. If you want the easiest to use VPN, pick NordVPN. Their apps couldn’t get easier, connect with one click or tap and forget about it. If you want to unblock TV services easily, choose ExpressVPN. They work with all the most popular streaming services including US Netflix and BBC iPlayer. If you want to use it on the most devices, select StrongVPN. With their 12-concurrent device connection limit, you can use their service on more devices than most. If you want to try risk-free, pick VyprVPN. They’ve got a completely free 3-day trial. Just pop in some payment details to grab the trial – don’t forget to cancel if it’s not for you! If you need longer to make up your mind, take CyberGhost VPN. They’ve got a 45-day money back guarantee which is more than any other service. A VPN is an online privacy service that you use in the form of an app. It jumbles up all of your data on your device using what is known as ‘encryption’ and sends it securely to another location. No one can read any of this data as it travels through this part of the service. Your data with then me untangled and passed on to the wider internet as usual. By encrypting your data, no one can spy on what you’re doing online. Encrypting your data is especially useful if you’re using public Wi-Fi points such as cafes, public transport or any other location where others can use the same Wi-Fi as you. ENCRYPTION: Is when all of your internet use is jumbled up and made unreadable. On your home Wi-Fi connection, you know the other users using the network. When you’re using a public Wi-Fi connection, you don’t. It’s those other users who could be snooping on what you’re doing. The person running the Wi-Fi point could also be recording your details. If you’re making payments or using other services that require you to enter sensitive data these could be at risk. Even though a VPN is useful when you’re out this doesn’t diminish their usefulness in the home. Companies and others can track what you do online based on your internet connection. They can start to build up a picture of your likes, dislikes, interests and pretty much your entire life depending on your search terms. While a VPN isn’t a magic bullet and a lot depends on what you put out on social media or what personal accounts you log into before searching it is a very critical tool in your arsenal for online privacy protection. It’s easy to think that all VPN services are the same, but this is not the case. For example, ‘free’ VPN services don’t offer the same level of protection that paid VPN services do. Also, different VPN services often have different policies about what types of data they retain. The five we’ve listed above all offer high-encryption levels and they’re considered some of the most reputable in the industry. However, that’s not the case for all providers, even paid ones, so it pays to do a little research even if you’re not entirely sure of what everything means. People often say, ‘I’ve got nothing to hide so nothing to fear‘. Yet we all have something to hide. It’s the reason you won’t share your bank account details with us or upload revealing photographs to the internet for all to see. A better way to think of ‘something to hide’ is that we all value our privacy. A VPN is a way of retaining your privacy in a world that is determined to know everything about your life. If you’re new to VPN use then it can seem like an intimidating place but like everyone you have to start somewhere. 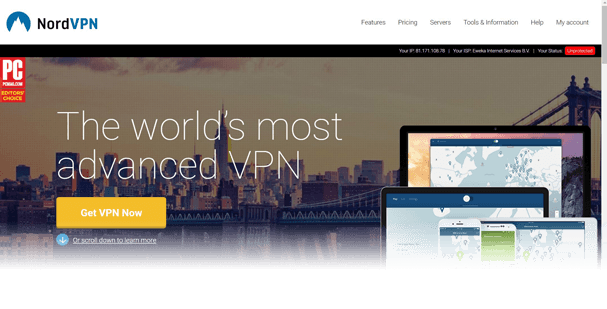 Our top recommendation is NordVPN because their apps are quick and easy to use and there’s no complicated set-up. They also have apps for almost all types of devices so no matter what equipment you want to use a VPN on, you are covered. Don’t forget they’ve also got a substantial 30-day money back guarantee too so even if you get stuck you can get your money back without question.